Indians Abroad for Pluralist India calls upon all progressive and democratic forces to join us to protest against growing repression in the world’s so called largest democracy. Ever since the right wing Hindu nationalist Bhartiya Janata Party (BJP) came to power in India in 2014, attacks on religious minorities and political dissidents have grown, both by the state and its vigilantes. Particularly disturbing are the attempts to muzzle voices of resistance by the students and intelligentsia. The Delhi Police recently filed charges of sedition against student leader Kanhaiya Kumar and nine others, for organizing a peaceful demonstration inside Jawaharlal Nehru University against the repressive policies of the government in 2016. 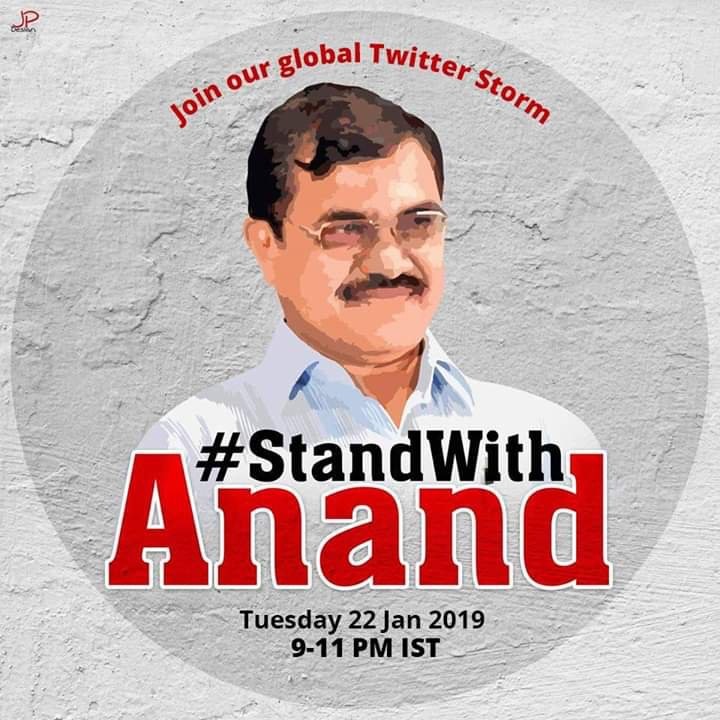 Likewise, well-respected columnist and social justice activist Anand Teltumbde, who is married to the granddaughter of the architect of the Indian constitution and towering scholar Dr. B.R. Ambedkar, faces arrest under a draconian Unlawful Activities Prevention Act (UAPA) for raising his voice for the poor and marginalized through his writings. He was charged last year, while five other activists like him were arrested and detained across India. Those arrested include a Telugu poet and a political activist, Varavara Rao, and human-rights lawyer Sudha Bhardawaj. Others taken into custody were two published authors, Gautam Navlakha and Arun Ferreira, and a former Mumbai college professor, Vernon Gonsalves. Ferreira and Gonsalves had been arrested and thrown into jail in the past too. They were all accused of being sympathizers of the Maoist insurgents. Teltumbde escaped the police dragnet as he was away, while his house was raided by the police in his absence. His plea for quashing the police case has been rejected by the court. If arrested, he might be incarcerated like Delhi University Professor, G.N. Saibaba, who continues to be imprisoned under UAPA despite being ninety percent disabled below the waist. His continued incarceration under inhuman conditions has already drawn criticism from United Nations human rights experts. Maoist insurgents who’ve been active in tribal areas have a big following among Adivasis, who often take up arms due to the high-handedness of the police and security forces. Many Adivasis see Maoists as protectors in their fight for survival from barbarity of the state. Police have not only branded those arrested as Maoist supporters, but some are being accused of being involved in a plot to assassinate Prime Minister Narendra Modi. These allegations have been strongly refuted by their relatives and supporters, who believe that all this is being done to stifle voices of dissent and win sympathy for Modi, who might face a tough general election this year. On the occasion of India’s Republic Day, we urge all concerned Indians in particular and those who believe in a just society to come together and raise our voices against this McCarthy era-like witch hunt of political dissidents associated with the leftist ideology under a fascist regime.